The Caddy Key is a shopping trolley coin that can be attached to a key ring. The Caddy Key's extensive scope for personalisation makes it an ideal marketing tool. It is one product that is guarnteed to be used and catch the eye time and again. When planning a large-scale advertising or marketing campaign, the Caddy Key may prove to be one of your most effective tools yet! We offer you a choice of different colours of tokens which can be personalised with your own design in mono or full colour. At that, the coins can be printed on one or on both sides. 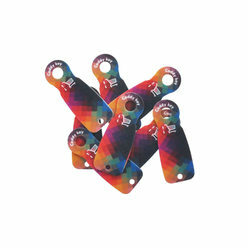 The Caddy Key is printed digitally with ink that adheres to and coats the coin to perfection. This high-tech method is ideally suited to highly intricate and detailed designs. 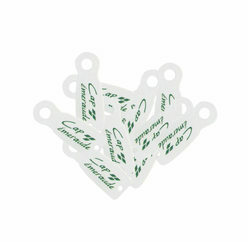 We can print both white and coloured Caddy Keys.